Other than family dentistry, Dr. Anoosheh is experienced in cosmetic dentistry, and uses various technologies such as Invisalign(Preferred Provider), implants, veneers, and Brite Smile Bleaching to attain the optimum healthy beautiful smile. 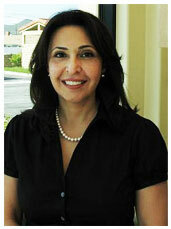 She graduated from the University of the Pacific Dental School in 1987. She also earned a Bachelor of Science Degree in Biochemistry from UCLA.